Tam Matthews was appointed Head of School of West Point Grey Academy in August 2013. He was previously Head of Ashbury College, an IB World School in Ottawa, from 2001 to 2013. While at Ashbury, Tam introduced a new Leadership Team management structure; expanded the boarding program, with students from over 30 countries; and led the school through two strategic planning processes and three major capital expansions, including a master campus plan renewal project. At WPGA, Tam actively supports the school’s vision to be leaders in future-focused learning, with a focus on empowering entrepreneurial thinkers who are adaptive, altruistic and globally-inspired. His collaborative, inclusive style of leadership models the school’s mission and reflects his commitment to learning innovation, student and staff wellness, teacher professional advancement, a robust school community and best practices in governance. In 2014, Tam led a strategic planning process, building on the school’s exceptional reputation and culture to advance its many opportunities for innovation and partnership. A graduate of independent schools, Tam studied at the University of Nice after graduating from Trinity College (University of Toronto). Following five years in international banking, he began his teaching career at Upper Canada College, as a history teacher and then as Associate Director of Guidance. In 1989, he became Director of Admissions at Lakefield College School, where he and his wife, Jan, were houseparents for the school’s first girls residence. In 1996, he was appointed Head of Albert College, where he opened the school's Junior School. Dedicated to furthering the growth of independent schools at large, Tam has served on numerous educational and community boards. 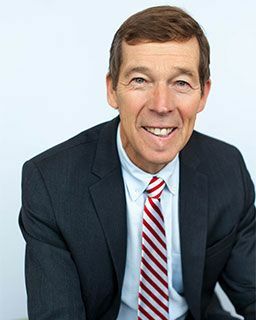 He is a past Chair of Canadian Accredited Independent Schools (CAIS) and is currently Chair of the Independent Schools Association of British Columbia (ISABC). He is a past Board Member of the Canadian Olympic Committee and the Royal Canadian Yacht Club. A former member of three Canadian Olympic sailing teams (1980, 1984, 1996), Tam enjoys keeping active and plays tennis, skis and cycles whenever he can. He and Jan have two children, Geoff and Alison, who both reside in Vancouver. In July 2019, Tam will retire from WPGA after six years of exceptional leadership at WPGA and a 35-year career in education, which includes three headships. He will continue to live in Vancouver and work as an educational consultant for ISABC and CAIS schools. Ciara was among the first faculty members at West Point Grey Academy in 1996, before the school had opened its doors, and has been instrumental to the school's success, including its educational philosophy, student-centered vision and mission, and caliber of teaching and learning. Ciara oversees teacher hiring across all disciplines in the Junior School, ensuring teachers’ continued growth as educators through ongoing professional development. She is responsible for academic programming and assessment practices for JK–7, and developed our English, CARE (character education) and learning support programs. Ciara serves on the school’s Leadership Team and Board of Directors, providing strategic insight on best educational practices and future trends. She is also a member of the school’s Building Committee, and led and managed the Upper Gym facility build, an 8,000 square-foot full-scale gymnasium completed in August 2018. Prior to joining WPGA, Ciara taught at the Canadian International School in Hong Kong and in the West Vancouver public school system. She holds bachelor's degrees in history and primary education and has a Master of Educational Administration with a research component on assessment practices. A member of the ISABC Pro-D Advisory Committee and CAIS National Forum Advisory Committee, she provides leadership in Foundations Skills Assessments (FSA) marking for ISABC, developed the Newly Qualified Teachers Program for ISABC, and creates provincial exemplars for the Ministry of Education. Ciara and her husband, Andrew, have a son, Ben ’21. A founding faculty member since the school's inception in 1996, Stephen has contributed greatly to West Point Grey Academy’s remarkable growth. As Head of Senior School, he oversees academic program development, cocurricular programming and staff professional development. He serves on the Leadership Team and Board of Directors to help guide and fulfill the school’s Strategic Plan and ensure best practices in education and governance. Stephen holds bachelor’s degrees in arts and education from Queen’s University and a Master of Education in administration. After teaching at the American School Foundation of Monterrey in Mexico, Stephen returned to Canada to "put down roots on our beautiful WPGA campus." A gifted educator, Stephen has a Master of Education and international teaching experience, and is a continuous learner with a passion for inspired leadership. Active in CAIS and ISABC associations and in the Vancouver community, he serves as a mentor to ISABC Team Leaders aspiring to their next level of leadership, and is a founding Board director of a charitable organization focused on youth mental health. In July 2018, Stephen was accepted, along with 150 veteran school administrators from around the world, into the intensive program “Leadership: An Evolving Vision" at the Harvard Graduate School of Education. Stephen and his wife, Charlotte, a longtime teacher at WPGA, have three sons, Miles ’18, Charlie ’20 and Sam ’23. In July 2019, Stephen will become WPGA’s third Head of School, continuing WPGA’s legacy of school leaders dedicated to Shaping Lives of Inquiry, Action and Joy. In July 2019, Tam Matthews will retire as Head of School of West Point Grey Academy and Stephen Anthony, Head of Senior School, will be WPGA's next Head of School. Our school community is happy and excited for both Tam and Stephen, and looks ahead to the next chapter of inspired leadership at WPGA. Click here to read the full letter announcing the headship transition from Peter Blake, Board Chair. On the heels of the 12th annual Vancouver Model United Nations Event (October 27-29, 2017), which WPGA hosted for 500 students, Mr. Matthews reflects on why these inclusive, globally inspired events and programs are so important in shaping the lives of our future leaders.